Mold, mildew, and dirt that has settled on your exterior surfaces can cause them to age prematurely leading to problems like deterioration, decreased strength, and leaks or separations that can let in water and unwanted guests. When renovating, reviving, or preparing to repaint the exterior of your home, decking, or other home fixtures, removing mold and mildew are imperative for proper paint adhesion and material protection. Our service adds cleanser and fungicide to ensure that your exterior is mold and mildew free. Our mold and mildew removal service completely eliminates and prevents the return of mold and mildew on all your home’s surfaces, leaving them clean, bright, and strong. Call 254-716-8685 to speak with our professionals about the benefits of mold, mildew, and dirt removal throughout Waco and Temple, TX. Pressure washing can occasionally represent a project that a homeowner can accomplish themselves. It can sometimes become necessary to hire a professional service, however. An entire house that needs cleaning will absolutely benefit from the attentions of a professional. Think about your project carefully before it begins, and contact eSquared Asphalt Maintenance for affordable and rapid work. 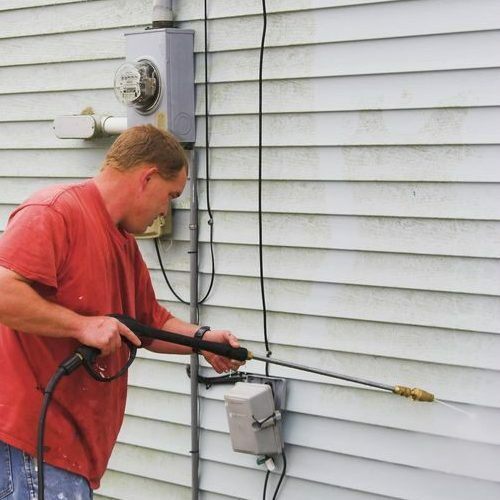 Typically, when homeowners possess a pressure washer, it’s a small home-use unit. While this is great for small, quick touch up and clean projects, it’s not ideal whole-home home cleaning. This project is different from a typical exterior cleaning job and will need fungicide or cleanser added. Home pressure washers are also not usually made to be used with cleanser, so the mold and mildew will not truly be eliminated. For mold, mildew, and dirt removal in Waco and Temple, TX, call us! When removing mold and mildew from your home, there are hazards like brittle soffit and fascia boards, roof overhangs, and siding or exterior separations that will need to be considered and evaluated beforehand in order to prevent damage to your home. Our professionals have experience in cleaning delicate, brittle home components without causing costly damage. Unlike small pressure washing projects around your home, a whole-home cleaning is very time-consuming. Our professionals can take the time needed to ensure comprehensive removal of mold, mildew, and algae from even the deepest nooks and narrowest crannies for complete cleaning of your home. Mold, mildew, and dirt removal can prevent further problems within your home, as well as ensuring new paint adhesion. It can help your home look brighter and more inviting, and prevent premature deterioration that can lower the curb appeal and value of your home. Call our professionals at 254-716-8685 when you need reliable, convenient mold, mildew, and dirt removal around Waco and Temple, TX, to get comprehensive service that lasts. Updated on March 21, 2019 at 1:48 pm by eSquared Asphalt Maintenance.